A police officer was shot and killed while serving a warrant at a Cape Cod home on Thursday afternoon. Officer Sean Gannon, 32, a member of the Yarmouth police K9 unit, was serving a warrant at a home on Blueberry Lane in the Marstons Mills area of Barnstable when he was shot. Gannon was taken to Cape Cod Hospital, where he later died. Gannon's police dog Nero was also shot. He underwent emergency surgery and is recovering at an undisclosed location on Cape Cod. 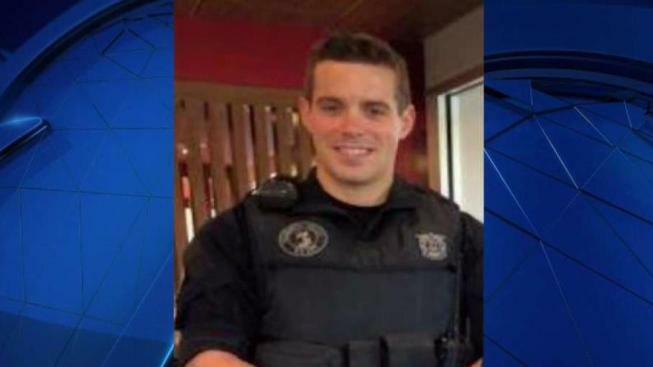 "With deep sorrow and heavy hearts the Yarmouth Police Department reports the loss of Officer Sean Gannon," the department wrote on Facebook Thursday night. "I treat all of my officers like they are my own sons and daughters," Yarmouth Police Chief Fred Fredrickson said. "To lose one is like losing my own." The suspect, 29-year-old Thomas Latanowich, of Somerville, was taken into custody after a standoff with police. Sharon Ellis, who lives on Blueberry Lane, looked out her window Thursday and saw three people enter the home where the shooting took place. The next thing she knew, there was chaos. "We did hear what I believed to be a couple of gunshots," she said. "It was all kinds of crazy." Latanowich has been charged with murder in Gannon's death. He was ordered held without bail at his arraignment Friday in the First District Court of Barnstable. When Latanowich was arrested in December of 2016 and charged in a non-fatal stabbing, Yarmouth police described him as a "notorious and violent criminal" with over 100 prior criminal charges in Massachusetts. A warrant was issued for his arrest last week after he violated his probation by being absent for a home visit and missing drug test. Mug shot of Thomas Latanowich from 2016. Fellow police departments and other public officials have been showing their support for Gannon, his family members and his colleagues on social media. Gannon's cruiser is on display outside the Yarmouth Police Department, covered in black-and-purple bunting. A makeshift memorial has been set up in his honor, and flags at the station are flying at half-staff. "I am heartbroken to learn of the passing of Officer Gannon," Gov. Charlie Baker said in a statement Thursday. "My thoughts and prayers are with his family, loved ones and the Yarmouth Police Department after this tragic loss. The Commonwealth is blessed to have courageous men and women who put their lives on the line to protect our communities every day." Our thoughts, prayers, and deepest condolences are with the Yarmouth Police Department as well as the Cape Cod Law Enforcement community! Rest In Peace Brother! This is a sad day for police officers across Massachusetts. Our hearts go out to the officer we lost today and to the officers' family. We are also thinking of our sisters and brothers at @yarmouthpolice and @BarnstablePDMa during this very difficult time. Our thoughts and prayers are with the Yarmouth Police Department. We hope the Officer is okay, and this scary situation can come to an end quickly and safely. We are sending prayers to our brothers and sisters on Cape Cod. A police officer has been shot in Marstons Mills, Barnstable. Sending prayers to the @yarmouthpolice Officer who was shot in Barnstable serving a warrant. Our thoughts and prayers are with you. Thoughts and prayers for the Yarmouth Police Officer and his family as the officer was shot today assisting in the execution of a warrant entry in Marstons Mills. Thoughts and prayers to the #Yarmouth Police Dep and the officer who was seriously injured in the line of duty. Tonight we are thinking of the family and colleagues of the @yarmouthpolice officer shot this afternoon in Barnstable. Prayers to the Yarmouth Police Officer shot this afternoon.